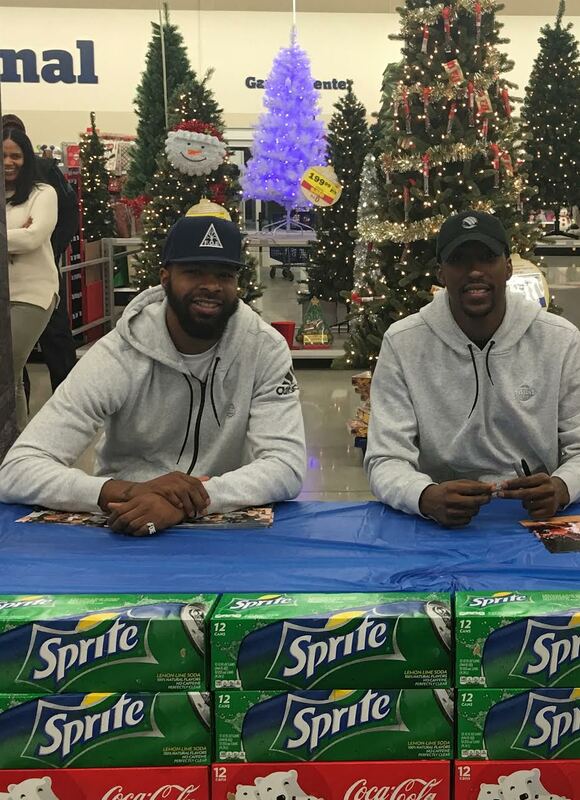 Lance Martinez from My Detroit Sports sends along this photo of Detroit Pistons players Marcus Morris and Kentavious Caldwell-Pope, captured during a recent joint appearance at a Detroit Meijer grocery store. This season, Morris is averaging 13.1 points and 3.9 rebounds for the 16-21 Pistons. Morris arrived in Motown prior to the 2015 campaign, via a trade with the Suns. The Kansas alum was originally drafted by the Rockets during the first round of the 2011 draft. Last season, the Kansas alum established career highs with 14.1 points, 5.1 rebounds and 2.5 assists per night averages. Caldwell-Pope is currently posting season tallies of 14.6 points, 3.5 rebounds and 3.0 assists per contest. Now in his fourth NBA season, the 6’5 shooting guard was originally selected with the eighth pick in the 2013 draft, out of Georgia. During his final season in Athens, the Georgia native was named SEC Player of the Year. Detroit basketball fans can check out numerous behind the scenes looks at the team, courtesy of this link.